The Fan Shout-Out Roundup – Zombies, Run! It’s just under 3 months since we launched Zombies, Run! to the world, and there’s been plenty of surprises and excitement since then. But by far the most gratifying thing about releasing the game has been the overwhelmingly enthusiastic response from our players. You’ve been leaping on every opportunity to tell your own Zombies, Run! stories, produce wonderful artwork and get involved in the game’s world as much as you can. We’ve loved every piece we’ve seen, so we’re going to share some of our favourites. To start things off with a bang, here’s a wonderful art-nouveau-inspired poster for the game by Phantoms Siren. We love the way this recalls old horror film posters with the lunging hands and limited colour palette, playing that off against the modern clothing and oversized headphones of the runner. It really sums up the core of Zombies, Run: old-school horror meets modern tech. Excellent work. Following that, take a gander at the first piece of Zombies, Run fanfiction we received. It’s a touching piece exploring the relationship between Sam and Doctor Myers, and it created quite a reaction in our lead writer, Naomi Alderman. Great job, Nextian! Delving deeper into the burgeoning ZR fanfiction community, here’s a great short piece by clicketykeys that gets right to the heart of the debate over which weapon’s the best for the Zombie Apocalypse. You might write a great story, clicketykeys, but you’ll never convince Jack you’ve found a better weapon than W.G! Of course, Runner 5’s faithful radio operator Sam Yao has received plenty of love from the fans, and we think this piece by eyesfilledwithstars is a lovely expression of how much Sam means to Abel and to the fans. There are plenty more fantastic pieces of ZR fanfiction out there, and we love all the stories that our fans are telling, and we can’t possibly feature them all here, but we’d be remiss if we didn’t mention . It’s a gripping epic, developing week-on-week, and we think you’ll love it at least as much as we do. America: keep writing! If you’re looking for an excellently-written blog in which one runner is charting her progression through the game, let us introduce you to Eve Glass. You won’t be disappointed. 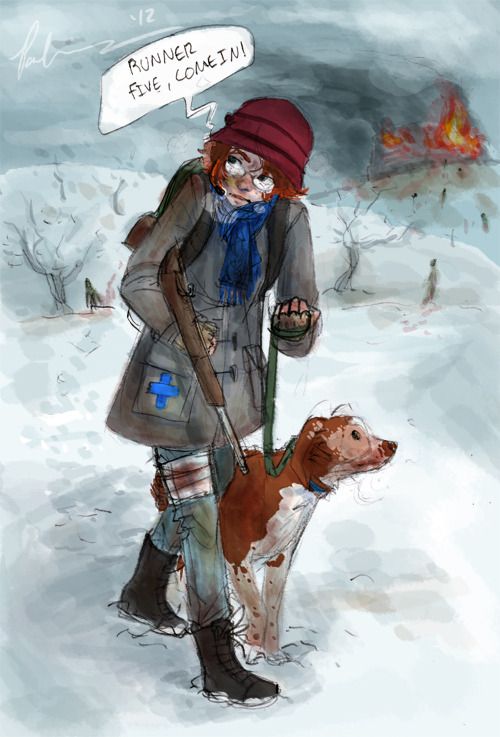 Walking the line between fanfiction, blog and artwork, we have an hilarious comic from Megacynics, completely nailing the dual experience of playing Zombies, Run! One of our favourite pieces of fan art is up next: an incredibly evocative self-portrait by Robin Parkins. This piece has a lovely, rich style which just hints at the grim realities of life post-civilisation while managing to remain personal. Excellent. To round out our art collection, here are portraits of ZR characters by the wonderful Brooke. It’s really great to see how Brooke’s pictured the characters: Jack and Eugene are surprisingly close to the real thing, and you have Janine almost spot on! Finally, if you’re looking for more Zombies, Run! chat, art and links, check out the guys over at Reddit’s r/Runner 5 and http://fuckyeahzombiesrun.tumblr.com – communities run by Zombies, Run fans for Zombies, Run fans. We love you guys. 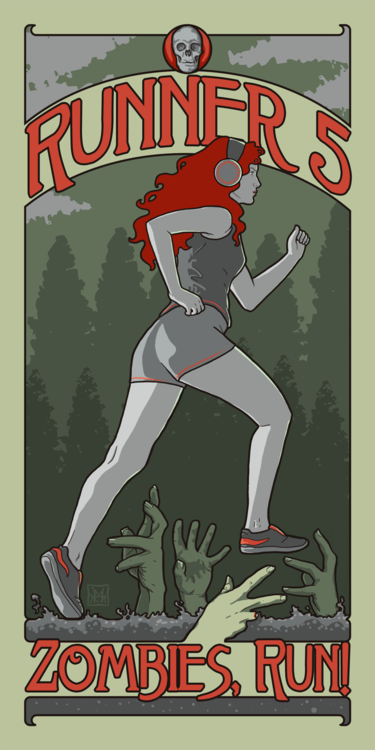 And if you’re on Fitocracy, check out the Zombies, Run! and Runner 5 groups. To wrap up: thank-you to all the fans out there who are sharing their love of the game with the world. We can’t tell you how much we love seeing what you’re up to. Next Post Android. ZombieLink. Windows Phone.